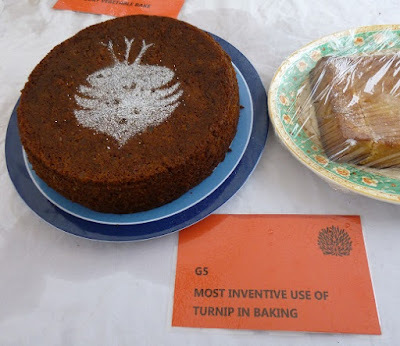 This weekend marked my biggest cake triumph since winning “Most Inventive Use of Turnip in Baking” at the Cordwainers Garden Country Show back in 2013. On Saturday it was the Hadleigh Show, which is a full on 1950s flashback agricultural show. It comes complete with assorted entries for best pig / cow / sheep / heavy horse, small children competing on Thelwell ponies, death defying stunts by a motorcyle display team and assorted stands where you can stock up on tractors and tweed jackets to your heart’s content. There is a Young Farmers Tug of War, a fun fair, an Australian with a sheep show and a string of single entendres, and I’m just gutted I missed the ferret display. The sun shines, the stewards wear suits with bowler hats and competition is rife inside the Flower Tent and Art Show. 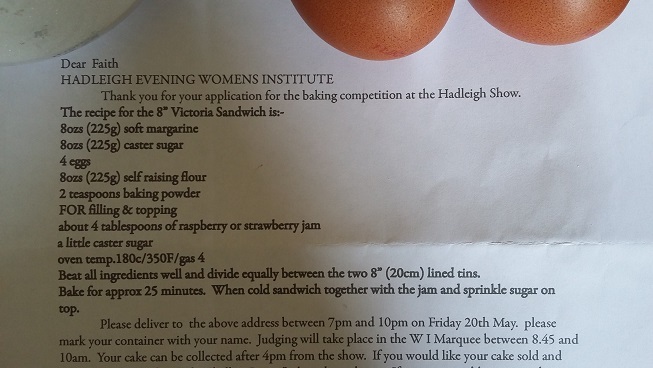 Most importantly to me, the Hadleigh Evening Women’s Institute ran a baking competition in the W.I. marquee. 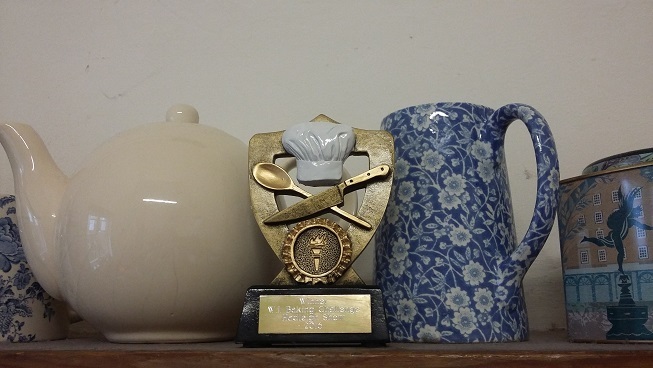 Fortunately from my perspective, the competition was for baking that icon of English afternoon tea, a Victoria Sponge. Now, I’m completely cack-handed when it comes to icing cakes, but on occasion I can crack out a decent sponge. My grandmother was a stalwart member of her local W.I. and I have fond memories of cooking cakes with her when we went to stay. This means I have been cooking Victoria Sponge cakes for longer than I care to remember. The classic Victoria sponge is very simple – just two layers of sponge, with jam in between and some sugar dusted on top. I love it because it’s quick, easy and doesn’t call for any expensive ingredients. Using value flour, own brand jam and the biggest eggs from free-range mixed-weight boxes, my cakes tend to come out just fine. Ingredients used in the cake pictured only cost about £1.50, and it was a big cake. Official recipe. No deviations allowed. I subsequently lost my nerve and used raspberry jam instead. Oven temp 180 C / 350F / Gas mark 4. Beat all ingredients well and divide equally between the two 8 inch (20cm) lined tins. Bake for approx 25 minutes. When cold, sandwich together with the jam and sprinkle sugar on top. So the night before the Hadleigh Show I strapped on my apron and got baking. My husband dropped off my second attempt with the Hon. Sec., and the next morning we all trooped round to the W.I. tent, and I was delighted to have won. Hurrah! Lulled into a false sense of security by this deceptively simple recipe? Ha. I was concerned about cut-throat competition in the cake category, and so did a bit of research before baking. Turns out if you wish to achieve the lightest of sponges, and most even of bakes, there are a load of extra tricks and techniques. So, for anyone keen to brandish their wooden spoon and take on all comers in a village show, here are the top tips I gleaned. And if you just want to bake a nice cake, some of them could come in handy too. If you’re entering a village show, whatever category, get hold of a copy of the entry requirements. Then stick to them. Those judges can be harsh. Back in the days of the Burton Overy Village Hall Produce Show I’ve seen beautiful floral displays disqualified just because the vase was too big. When it comes to the cake categories, if it says an 8 inch tin, use one. If it doesn’t mention vanilla essence, then don’t go all off piste and chuck some in just for the hell of it. This is like an exam, people – read the rules or recipe, then read them again, then do what they say. Sponge cakes are not designed to last, unlike dense and alcohol-sodden fruit cakes that can sit around for years. 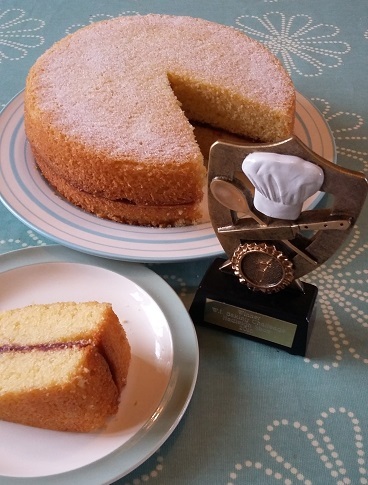 If you’re keen to compete, clear time for baking shortly before the deadline for entries, so your sponge will be as fresh as possible when the judge sinks their teeth into it. I’m sure many purists start pearl-clutching at the very idea of using anything other than butter in their baking. But really – just try Stork. It’s so much softer, it can be used straight from the fridge, and your cakes will rise like a dream. Smile sweetly and I don’t reckon anyone will ever know. If you insist on using butter, at least make sure it’s at room temperature and soft, rather than a lead bar straight out of the fridge. I was just glad that the recipe mentioned soft margarine so I could use Stork with a clear conscience. Don’t try using eggs straight out of the fridge. Heft them out several hours before so they can reach room temperature, or don’t keep them in the fridge in the first place. If you’re going full-on village showtastic, no doubt you’ll have a handy marble shelf in your larder anyway. Apparently there’s some sciency bit about how cold eggs can curdle your mixture, and “result in an inferior rise”. Well I’m sure no-one wants that. Also, use decent sized eggs. Some recipes suggest using the same weight of fat, flour and sugar as the weight of the eggs in their shells. If instead the recipe specifies the weight eg 4 oz or 8oz, then small eggs won’t be big enough, and you’ll need at least medium-sized eggs. Baking powder can taste pretty overpowering* if you put too much in. Imagine Mary Berry wrinkling her nose, and Paul Hollywood looking aghast. So if the recipe says 2 teaspoons, it means 2 level teaspoons, and not hurling in half a packet, Muppet Swedish Chef stylee. Half the time when I’m knocking up a batch of biscuits to bribe my children, I’ll use whatever sugar we have to hand – granulated, demerara, soft brown, whatever – even if it does change the taste and texture a little bit. Granulated sugar is noticeably cheaper than finer grained caster sugar. However, come competition time, I made a special trip to buy caster sugar, rather than using the granulated version we already had in the cupboard. Now I’m pretty partial to strawberry jam in a Victoria Sponge. However, when I started searching the web, I discovered W.I. commandments about using raspberry jam instead. Apparently, the pips help stop the top and bottom from sliding apart. Who knew? Anyway, my husband kindly agreed to pick up some raspberry jam (with seeds! with seeds!) from the Co-op on his way home from taking our daughter to cricket practice. Phew. Disaster averted. Baking requires precision, so I really recommend electronic scales, rather than trying to eyeball a madly wavering pointer. The oven needs to have reached the right temperature before you bung in your cakes, or they won’t rise properly. Switch it on before you start weighing and measuring and preparing tins, although perhaps not before going shopping for the ingredients, so it has the time to heat up. Make sure you have the right size tins for the recipe and show rules. The night before the Hadleigh Show I had my ruler out, checking with pair of baking tins made the grade. Avoid fancy fripperies like fluted tins in favour of straight sides. Also, make sure they’re deep enough – you don’t want the mixture rising so high it splurges all over the sides of the tin. Reckon my tins are about 3 cm high. I reckon one of the keys to a prize-winning sponge is not leaving half of it behind in the tin. Do not skimp on tin preparation. Fork out for some baking parchment, roll it out on a clean, flat surface, pop your tin on top, and draw round the base. Curse when the biro doesn’t make a mark on the grease resistant paper. Press harder, so it makes a visible imprint. Then ta dah you can cut out circles the same size as the bottom of the tin. Disclaimer: some purists put a strip of baking parchment sticking up all round the sides of the tin, with cuts up one long side to make flaps that fold under the circle at the bottom. I don’t bother with all that faff, but just use a bit of extra Stork to grease the sides of the tin and all over the base. Then I put a circle of baking parchment in the bottom, and then I grease that too. (I have no idea why I grease both under and over the paper – I just do. Call it superstition). Crack your eggs into a cup, rather than straight into the mixing bowl. This makes it easier to spot any stray bits of sheel and fish them out. Let’s face it, no-one want to bite into a chunk of shell in a mouthful of cake. Use a fork to break the yolks and give the eggs a quick whisk around before adding them to your cake mixture. Yet another faff I don’t bother with in everyday baking. However, needs must, and when the whole internet is telling me I need to seive my flour not just once, but twice, I had a go. I sifted the flour once into the bowl I used to weigh it, and then again into the mixing bowl. It’s all to do with getting air into the mixure, and hence a light and fluffy sponge. I even used a plastic sieve rather than a metal one, in case the metal affected the taste. I had it dinned into me by my mother and grandmother that for a successful sponge cake, you need to work fast. As soon as the liquid (eggs, milk, whatever) hits the raising agent (self-raising flour, baking powder), the clock starts ticking and you need to get the cake into the oven asap. In practice, I suggest switching your oven on well in advance, preparing your tins and getting all the ingredients measured out, before you start mixing anything. Ooooh now we’ve reached the contentious part. The traditional cake making method involves beating together butter and sugar until light and fluffy, then gradually introducing the eggs, then finally folding in the seived flour and baking powder. Adding a tablespoon of flour with each egg can help stop the mixture curdling. However, there is an alternative view which uses a (whisper it) food processor. And puts all the ingredients in in one go. It’s quicker, kinder on the arms and harder on the washing up. I’m quite a fan of the trad “wooden spoon and mixing bowl” approach, made easier by using Stork rather than recalcitrant butter. However, Mary Berry is a strong proponent of the all-in-one method. I was also keen to get the smoothest mixture in the speediest time (see tip 14, above), so on this occasion I resorted to the Magimix. I put in the sugar and Stork first, then the beaten eggs, and finally sifted the flour and baking powder on top. Press the button, stand well back and pray. Then scoop the mixture off the sides with a spatula and give it another zoom, to avoid lumps and make sure everything gets mixed. 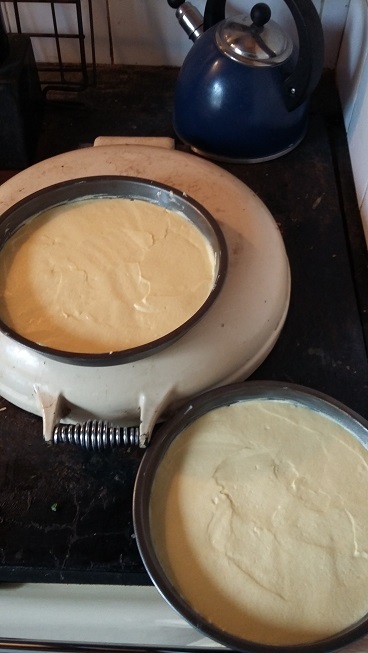 If you want to bake two even-sized cakes, you need equal amounts of cake mixture in both tins. Using scales is way easier than attempting to judge by eye that you’ve divided the mixture in half. 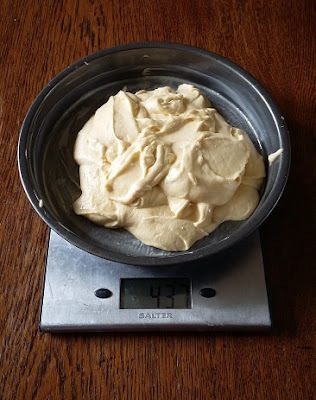 Half the mix usually weighs slightly less than double the weight of the fat/flour/sugar. Translation: for a 225g recipe, I aimed for about 437g in each tin, as just under 450g. This helps save time, rather than trying to switch spoonfuls of cake batter from one tin to the other to even them up. Want an even rise and two impeccably matching cakes? Spread the mixture out in a nice even layer. I use a normal table knife, but dip it quickly into a mug of cold water first, so it glides over the top of the cake mix rather than dragging it round the place. Stop every so often, wipe the blade clean, dip it in the water and start spreading again. Just don’t get the knife too wet and damp down the rise. This is where the tension mounts. It’s balancing act between your plastering skills and needing to get the cake into the oven as quickly as possible. Edge of the seat stuff, folks. To avoid a raised ‘lip’ around the edge of the cake, run a (very clean) finger round the edge right next to the tin before you put the cake in the oven. Again, in the interests of an even rise, put your cakes on a flat shelf. Otherwise they are likely to come out looking like a ski slope (voice of bitter experience). If you can fit two tins on the same shelf they’ve got more chance of cooking the same than if one is on a shelf above the other. Put on your oven timer for a good 20 minutes, then step away from the cooker. Make a cup of tea. Corral your children. Try not to wander off and forget about your cakes completely, but otherwise you really do need to avoid opening your oven too early. That rush of cold air will surge in and make an otherwise beautifully risen cake slump in the middle. As a cautionary tale, I present you with a picture of my first attempt last Friday. 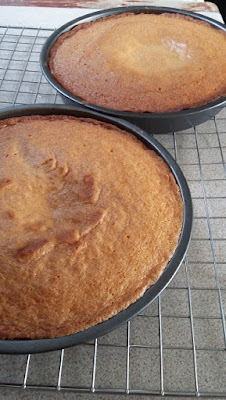 Not only did I open the oven too early, to see the cakes sink before my very eyes, but in swapping the tins round for even browning I bashed the top of one against the AGA rail. Aaaargh. Cue much swearing and a second attempt. We ate it anyway. Ah yes, the AGA. We have an extremely elderly AGA, with one ferociously hot oven and one oven so cool it tries to bore meringues into submission. If you’re familiar with AGAs, you’ll realise that they don’t have a temperature dial which you can just turn to 180C safe in the knowledge the oven will actually reach that heat. Nor do they have any glass in the door, so you can keep an eye on the contents without opening the door and flattening your cakes. 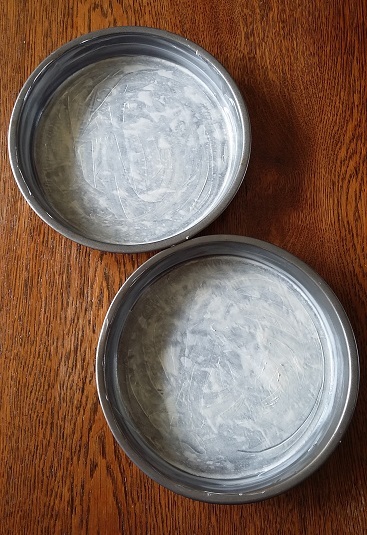 If I want to prevent the roasting oven from incinerating any baking, I have to put the tins on one shelf, and then insert the cold shelf just above them – literally a large flat piece of metal – which creates a cooler area underneath. But – and this is a big but – the cold shelf doesn’t stay cold for very long. Forget cooking deep cakes, anything higher than a tray bake gets blackened on top before it cooks in the middle. So given the guess and hope approach needed for AGA cooking, my top tip for competition cakes is to have a bit of a practice, and be prepared to make several attempts. (Just not too many attempts one after another, or the oven will loose heat and cool right down…). The upside is that when it actually works, all that radiant heat that AGA enthusiasts bang on about does create a lovely light, moist sponge. So there’s that. Quick clue: black = bad. What you’re aiming for is a lovely golden brown colour, which hopefully you can observe through a handy glass door in your oven, with a handy oven light on. The cake should have shrunk away from the sides of the tin a little bit, and if you tap the top with your finger it should spring back, rather than sinking in. If you insert a thin skewer into the cake, it should come out clean. This is another contentious point. It’s really important not to slice off the sides of the sponge or leave drag marks, but on the other hand, you do want it to come out of the tin cleanly, without sticking. Just after taking the cakes out of the oven, I use a normal table knife rather than something super sharp, and slide it gently round between the cake and the tin, to loosen them. Hopefully you can do this without hacking great lumps out of your cakes. Now leave the cakes to cool for a good 10 minutes. 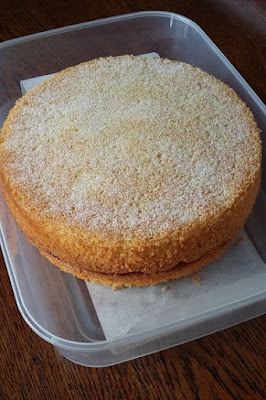 If you try to turn out a Victoria sponge too early, it will be too soft and is likely to break apart. Not good. Apparently, grid marks are a major no-no in competition cookery, which is where tea towels come to the rescue. Step one: put a clean tea towel over the top of the cake tin. Use one hand to hold the tea towel flat on top of the cake. Step two: slide your other hand underneath the tin and turn the whole lot upside down. With any luck you should now be able to lift the tin off cleanly, leaving the cake behind, on top of your tea towel clad hand. Make sure you peel off the circle of baking parchment now, as otherwise it could taste rather strange. Turn the cake right way up by placing a cooling rack, covered with another tea towel, on top. Then carefully turn it all back again. The important part is to have the filling side of the cake next to the cooling rack, to avoid any risk of rack marks on the visible side. Confession: the top of my sponges didn’t look great because they rose up and touched the underside of the cold shelf. So I turned one layer upside down, and had the tin side as the top of my cake. I’m not sure I’d get away with that on another occasion. Use the least favoured sponge as the bottom of your cake. Hopefully it won’t have shot up like a mountain peak. However, if you’re looking at a conical sponge, you may need to slice off the pointy top so it’s a flat enough surface to put a second layer on top. Wait until the cakes have cooked before you attempt to get handy with any filling. The Hadleigh Show judge apparently had stern words for anyone who leapt in too early with their jam, as it soaked into the cake. Tut. I recommend putting a liberal four tablespoons of jam into a small saucepan, with a tablespoon of water, and heating it gently so the jam melts but doesn’t boil. It’s then easier to spread softened jam over the bottom layer, without gouging out chunks of cake as you go. Put the top sponge carefully on top of the jam covered bottom layer, and get set to sprinkle some sugar on top. I used caster sugar, as specified in the recipe, but normally I prefer icing sugar as it tastes less crunchy. Top tip: use a tea strainer, and hold it to one side when you pour in the sugar, so it doesn’t dump a whole load in one place. Then sieve a light even coating over the top of the cake. Think about the display. Dig out a nice plate that is large enough for the cake to lie flat. For the Hadleigh Show, I had to submit my offering in a tin, rather than going along and setting it up on the table myself. To help get it out intact, I lined the tin with a wide strip of baking parchment that stuck up at either end. This not only helps stop the cake sticking to the bottom of the box, but also means the cake can be lifted out by holding the paper at each end. If you want to stand a chance of getting any equipment back, put your name on it. Stick name labels on that nice display plate, any cake tin, and even the lid too. A cake made in multiples of 8oz is pretty hefty, and should serve at least 12 if not 16 slices. If you’re cooking at home you can scale it down as small as 2 eggs with 4 oz each of Stork, sugar and self-raising flour, and a single teaspoon of baking flour. With a smaller cake, use 7 inch tins and a shorter cooking time, say 20 minutes rather than 25. Once you’ve mastered the basic sponge, you can run the changes with loads of different flavours. Bung some fresh strawberries or raspberries in the middle, and add a layer of whipped cream. Go wild and grate in some lemon or orange zest. Take out a couple of tablespoons of flour and substitute them for cocoa, for a chocolate flavour. Do half normal, half with added cocoa and whirl it together for marble cake. Bung in a tablespoon or so of strong coffee. Try using blackcurrant or cherry jam. Then buy some bigger trousers. 35. Go forth and conquer! Now that you’re primed with top tips for baking a winning Victoria Sponge, good luck with your own entry in any village show. (Here’s another photo of the type of fine trophy that could be yours, just for inspiration). If you’re still reading – well done. Until I sat down and wrote 35 top tips on baking a Victoria Sponge, I never realised how much I cared about cake. Reckon the turnip stencil sealed the deal. Anyone else have any top tips for successful sponges? Or other village show triumphs or disasters? I’d love to hear. Great step by step instructions and many congratulations, too! 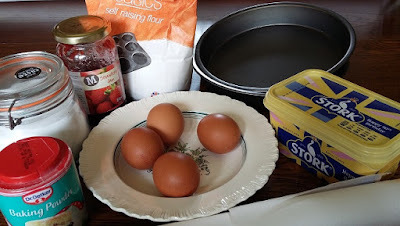 I have always been able to make a Victoria sponge. My mother taught me when I was about eight years old. She always used margarine, Blue Band in the days when this was available and now I use Bertolli. I have never added baking powder, though. Good self-raising flour should make an 8oz mixture (all the ingredients add up to 8 oz) rise. With my electronic scales, though, I now weigh the eggs and make up the other ingredients to the weight of those eggs, some of the eggs we have from our egg man who calls with fresh, free-range eggs are very large indeed, and four of those would unbalance the rest of the ingredients, so my tip is to weigh the eggs and then all the other ingredients (the fat, sugar, flour) should be this weight, too. Great tip about using the "weight of eggs" method, especially when the eggs are unusual sizes. Hadn't thought of using Bertolli – is that the olive oil one? Absolutely brilliant post. Some great tips there, thank you. I might even be tempted to enter a cake at one or more of the local shows after reading this!! Oh yes DO enter your local show(s), and good luck! Do you enter the fruit & veg sections already? Just venturing into victoroa sandwich cake making. Thank you for a very thorough article. May i suggest one tip i have been given. When your sandwich mix has been made add 1 tbs hot just boiled water. This prevents the mixture peaking as it bakes. Ooooh interesting about adding some hot water, that’s not a tip I’ve heard before. Must try it to see! Good luck with baking your Victoria sponges. I found this superb blog yesterday – followed your suggestions and blow me down, 1st prize today in our local show!! Rachel! That’s amazing! Many congratulations on winning 1st prize. Many thanks also for taking the time to let me know, I’m absolutely delighted. Oh wow that’s amazing! Many congratulations on your prize-winning Victoria Sponge. Very glad if my post helped, thanks so much for letting me know.